Sign up for Broadjam today to follow Perfect Harmony Men's Chorus, and be notified when they upload new stuff or update their news! Perfect Harmony Men's Chorus is Madison's gay and affirming men's chorus. Perfect Harmony Men's Chorus creates, enriches and transforms community through music. We sing to make a better world. We perform a variety of styles of music and are active creators of new music both from within our organization as well as through commissioning local artists. 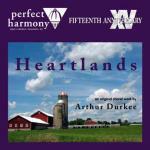 We recently released our newest album entitled Heartlands based on the stories of members of Perfect Harmony.